I’m supposed to be writing my sermon. I’m supposed to be writing a sermon for preaching tomorrow in front of smart, faithful people who trust and respect me enough to pay me to stand up in front of them on a regular basis and talk about the stuff I see in the bible. Oh, I am SO supposed to be writing my sermon. But the book came today. The book came today with my little story in it and my name in it and some words I wrote months and months ago printed in it, that I can touch and hold and sniff and show to my loves-to-write kid. The kid who dreams of one day holding a book of her own with her name in it. The book with stories about and by my sisters, my peers, my mentors, my friends, my heroes. The book of their moments, which are also totally my moments. So I’m laying in bed, under a mountain of bible commentaries and sermon aides, not writing my sermon, but reading the book. Reading The Book. I’m 36 pages in, and somehow it is both too much and not nearly enough. These women. These brilliant, bold, faithful, hilarious women. I’ve followed, lurked, stalked, and visited on some of them for years, through the adventures of the RevGalBlogPals. Others I’m just discovering right now. But this book. Something about holding their lives, their moments, their callings, their words, in my hands. I can’t put them down. But I have a sermon to write. And they’re not going anywhere. 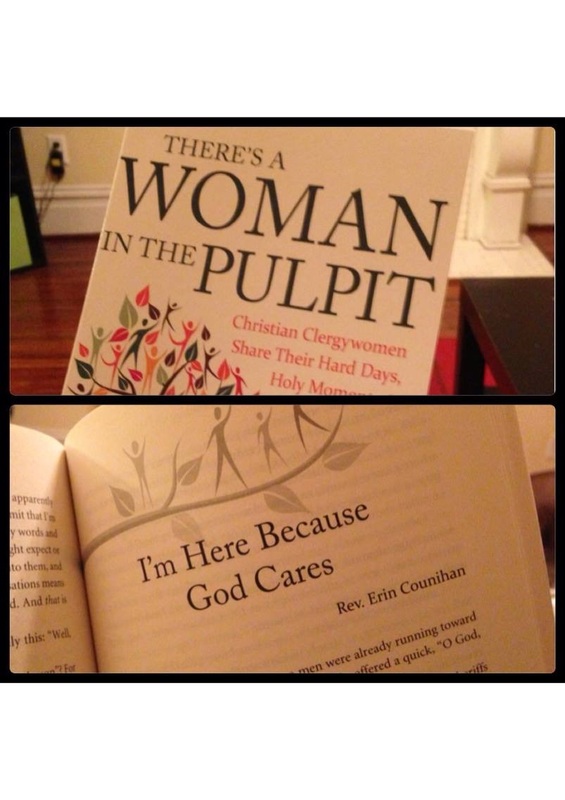 There’s a Woman in the Pulpit is a collection of stories and experiences shared by more than 50 clergywomen representing 14 denominations. We met and connected online, by doing just that- sharing our stories. What was once a blog ring is now a thriving site where clergywomen and clergywomen supporters gather to share stories, advice, prayer requests, best practices, theological reflections, practical resources, and ministry ideas. This book is now available for purchase through Amazon, and Barnes and Noble. For you, friends, a story…. There once was a new pastor, who survived her first Holy Week. It had been a lovely week, but a busy one with many long days and nights and not much sleep, and so, so, so many worship bulletins prep’ed. Alas, on Tuesday after Holy Week, she could not bring herself to do ONE MORE bulletin. So she put it off. And off. And off. The church secretary didn’t mind because, she too was totally unwilling to deal with ANOTHER church bulletin. So, on Thursday and Friday they threw something together and claimed to have proof read it, and printed and folded and sorted and printed the bulletins. All the bulletins were printed with the wrong text. Newbie Pastor sprints back to her pulpit, slightly out of breath, majorly purple-faced, and reads the day’s lesson. Welcome to the sit-com that it my life in ministry! It was one of those moments where you know that it is special and holy and precious and rare, and it is changing you, and that you will cling to it, remember it, relish in it for years to come, and you know that now even as it is happening. Yeah, it was one of those moments. My first Easter as a pastor. Earlier in the week, I’d thought, this isn’t so bad. Why do all the pastors I know stress so hard about Easter? Why do they worry and overwhelm themselves? This isn’t so bad. Fast forward to 5 thirteen hour work days later, two of which were spent in the office WITHOUT WORKING INTERNET ACCESS. After a lot of worships in a lot of different places, after folding bulletins at 9:30pm. After a slight personal meltdown over being a bit homesick. After the Easter Egg Hunt in the park, the protest march up the street, and after the OH MY MARY I ALMOST FORGOT EASTER VIGIL. After all of that, it was 11pm Holy Saturdaynight and I was laid flat on my broken couch watching HGTV on my DVR eating chips and chocolate with not even a hint of a sermon and 6 hours until I needed to be at church to start the Easter action. After a bit of a sermon that I wasn’t too proud of came to the keyboard. After two and a half hours sleep. I sat in the sanctuary alone at 5am Easter morning. I read the days text’s over and over again. I listened to the soft, sad Taize songs of Good Friday, and lost myself in the cross our congregation had made. I read the texts over and over again. Out loud. In the sanctuary. Alone. And then it was time. It was time for Easter. So I changed the music and read the story again and stood in front of that cross and lived Easter morning. All by myself. And burst into tears. Two minutes later, I was still sobbing, standing in the middle of the sanctuary, blasting Of A Father’s Love Begotten, acapella in four part perfect harmony, when our music minister walked in, silently sat down, and started sobbing herself. It was Easter. Sunrise worship was short and beautiful. Then those wonderful, holy people came inside and we all turned the sanctuary over from Good Friday to Easter morning. I didn’t cry in front of them. But I wanted to. We all retreated to our corners for naps- a couple elders went home, one went to the mission building, the music director claimed a couch in the bible study room, and I scrunched up on the big chair in my office. It was still for a bit. I awoke to the copier printing. Then I heard the choir rehearsing. The door shutting. The band checking. The kids hustling. The bells ringing. Of course, I’d put the cross in the wrong place, so we had to move some things. And of course, I’d forgotten to print things and assign a couple things, and then there was that matter of a children’s sermon. Ack! But everyone picked up a piece and everything was covered and handled and orchestrated and it somehow was time for worship. And then there was this moment. It lasted the whole hour. This precious gathering of beloved family, who know real struggle and controversy, but who sit together in hope and love. And somehow, I got to speak to them. I got to speak to them. I got to tell them that we are all loved and forgiven and loved. I got to tell them that Jesus had already risen, even as it was still dark, even when they didn’t know it yet, even in places they didn’t know yet, that he’d already conquered it and risen and it was going to surprise and shock them and I said all that in a sermon I wasn’t proud to have written but somehow by the power of the Holy Spirit it was special in the moment I spoke it. And I could see it when I connected eyes with so many of them. Them whom I have come to love. And respect. And cherish. I got the words out just barely, and then I sat and burst into tears. The service went on and I got to preside over the table, and that was a moment. And the day went on and there were conversations and meals and music and other moments. But that one. That one moment will be with me forever. The gift of this job. The gift of this call. The gift of this first Easter. The gift of God’s grace. All in that moment. Forever.